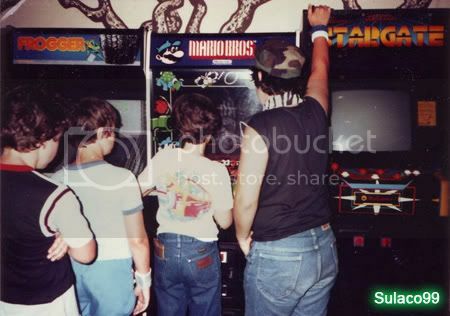 Arcades In The ’80s – We Went OUT To Play Video Games! It’s impossible not to sound super old when talking about arcades. Kids nowadays get a big laugh out of the fact that we used to actually go out to an arcade to play video games. Even though most of us eventually had an Atari home system growing up, we still blew our pocket full of quarters in the ominous looking Star Wars Arcade game at the local Space Port in the mall – at least I know I did! The ultra high tech, home based and portable video games of today are no longer the multi-faceted sensory ritual they used to be in the ’80s. Even though video games have evolved so much from a technical aspect, they are no longer the full blown experience they once were. Sure, new games can immerse us into the creepily realistic world of a first person shooter on X-Box or PS3, with 3-D graphics that will make us question whether we’re in our living room or some chemical plant fighting bad guys, but it’s not the same. Nothing can compare to the feeling I used to get before hopping into the Space Harrier arcade game at RazMaTazz in Sayreville, NJ! In the arcade, so much care was put into designing the game cabinets that housed the screen, joystick, and buttons. If the artwork on the side panels wasn’t elaborate and eye catching enough, we might’ve passed right by it. You don’t have to slip quarters into your home console or your tiny portable, you don’t even have to go to a store to purchase a game anymore! At this point in time we can beam a game directly to our home console in literally under a minute. The communal aspect of physically being in the same dark room and hearing the same fusion of sound effects from various games around the room with button tapping and click clacking as the back beat, and even gaining an occasional crowd to root you on has evolved into a primarily home based adventure. This transition is much like the way Netflix and Redbox have made some of us opt to stay home rather than go to the movies. There’s plenty of gamers much older than me who have moved with the ever changing technology. Personally, I’ve never played a game against someone online and I don’t think I ever will. I don’t want to wear a headset while playing, nor do I care to hear people talking video game trash in my ear. If they were physically beside me in a black lit room, eyes transfixed on the action on the glowing screen, playing a finger numbingly competitive game of WWF WRESTLEFEST, I would welcome the trash talkin’. I think my days of video gaming are tucked away with my memories of my beloved Sega Master System. ← Chiller Theatre Spring Spooktacular 2011 – All Weekend Long!